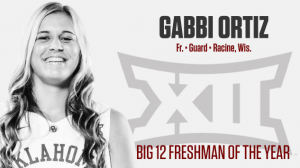 Gabbi Ortiz `14 continues to make enormous strides on the court! 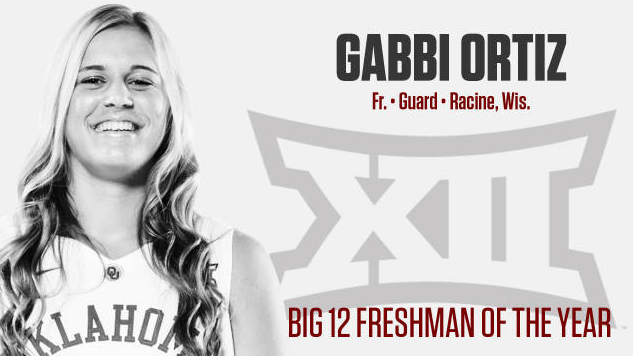 This week, Gabbi was named Freshman of the Year for the Big 12 Conference. She is currently a Sooner Point Gaurd at Oklahoma University. We couldn’t be more proud of this tremendous student-athlete and Prairie Alumna! (Sonnersports.com) – Ortiz, also named to the Big 12 All-Freshman Team, has started every game at point guard for Oklahoma as a true freshman and helped the team to a second-place finish in the Big 12. She contributes 7.9 points and 3.6 rebounds a game while ranking eighth in Big 12 assists (3.6 apg), ninth in assist-to-turnover ratio (1.3) and 10th in 3-pointers made per game (1.4). In league contests, the rookie averaged 3.4 assists and had a 1.6 assist-to-turnover ratio. She picked up two Big 12 Freshman of the Week honors. This entry was posted in All News, Athletics, Featured, Upper School by Communications Department. Bookmark the permalink.